Meet Dee-One: He's 27 and is the first of 3 siblings and a stand-up comedian. Dee-One loves Wizkid and says nothing will make him quit the game. If he wins the cash prize, he will start a comedy agency to help upcoming acts. He has no favourite colour, neither does he have any hidden talents. From an early age, Dee-One has learned to laugh at everything and has developed this talent into an art. He also enjoys reading the Bible, poetry, dancing, rapping and singing. 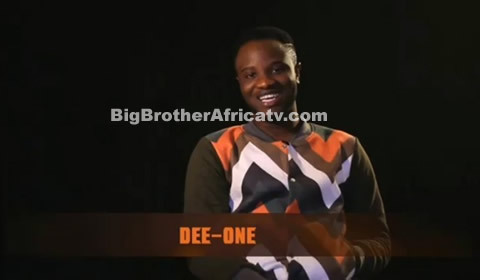 Dee-One confessed he would sorely miss his phone, but he can trust BBNaija fans to love the humour he brings into the House.